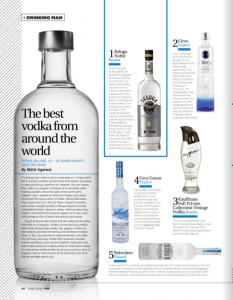 Before you ask, no – all vodka doesn’t taste the same. By Nikhil Agarwal. 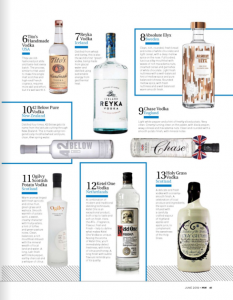 Enjoy Skyy Vodka & Jim Beam anyway you like at our partner restaurant. Absolut’s best representation of luxury vodka is a premium, handcrafted vodka made from wheat and naturally filtered water. 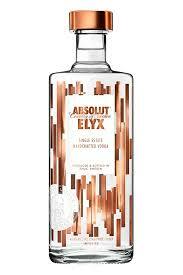 Unlike the distillation of Absolut Vodka, which is entirely controlled by computers, Absolut Elyx is a much more labor intensive and “handcrafted” process. The vodka is manually distilled in a copper rectification constructed in 1921. Today, it is operated by a select few who have inherited their knowledge and expertise from generations of vodka makers. The copper naturally removes traces of compounds in the spirit, purifying the vodka and adding to its unique silky texture. Elyx is fresh, smooth and silky with aromas of sweet grain followed by spice, vanilla and sweet fruit on the creamy palate. It is beautiful neat, but can be enjoyed on ice or in a vodka martini. 1) What are the essential barware needed to set up a home bar? A wine fridge, a fridge for beers and other mixers , a range of glassware for every kind of drink possible, a wine saver, cocktail shaker, bar spoon, strainer, bitters, muddler, ice machine and and a mini ice crusher, citrus fruits and other ingredients that go into your favourite cocktails and Triple Sec. 2) What sort of liquors should a bar stock? There is nothing like a well stocked bar offering a range of whiskies, vodkas, beers, liqueurs and other spirits and of course a range of wines. Various age statements and styles of whiskies from different parts of the world. A couple of vodka’s, a few gins, Cognac and/or brandy, tequila etc are a must. When it comes to wine, no bar is complete with out some sparkling wine, reds, whites and rose’s. A couple of fortified wines for those after dinner drinks also works wonderfully. 3) What is the trend in home bars? I think home bars are getting more sophisticated since entertaining at home is gaining importance and drink culture has really taken off. Also young adults have higher disposable incomes and they approach their home and their bars with a certain amount of flair.